Nicknamed the Moon Watch since it was the first watch to be worn on the moon, the Omega Speedmaster was upgraded to include a jaw-dropping moonphase complication. The Omega Speedmaster Moonphase Master Chronometer Chronograph was revealed at the 2016 Baselworld, and it’s been making its mark on the watch industry ever since. Now you can read our Omega Speedmaster Moonphase review to see what makes this watch so unique. With a whopping 44.25mm diameter and 16.85mm depth, this watch makes a statement. Not every man can get away with wearing a watch of this size, but those who can seem to rock it. This watch works well for the weekend or work day, but it should probably be left at home for more formal events. At this size, it would be rather difficult to comfortably fit the watch under a jacket sleeve or cuff link. Although this watch is available in yellow gold with a green liquid metal bezel and in Platinum with a red liquid metal bezel, I’ll be focusing on the stainless steel with a blue dial and the Sedna gold with a brown alligator strap. While the former are rather rare, the latter will be widely available for purchase. Don’t let the section title confuse you; the dial isn’t the only thing blue in this Omega Speedmaster. This model features a blue sun-brushed dial, a blue ceramic bezel, and a blue alligator strap. You can also purchase this watch with a stainless steel bracelet, but in my humble opinion, the blue strap adds the final touch to this brilliant watch. For the first time in Speedmaster history, Omega has used Liquidmetal for the tachymeter scale. According to Omega, Liquidmetal is three times as hard as stainless steel and when Liquidmetal is blended with ceramic, your watch will look brand new for longer than you could ever imagine. Unless you’re an Omega expert, you may not be familiar with Sedna gold. Omega’s 18K Sedna gold is an alloy in which the blend is made up of at least 75% gold and the remainder of copper and palladium. This blend results in a reddish color. The Sedna gold model features a black dial, black ceramic bezel, and a black alligator strap. Instead of using Liquidmetal for the tachymeter scale, this model uses Ceragold (a ceramic and gold composite). Although your watch may be Swiss made, that does not mean that it is 100 percent made in Switzerland. 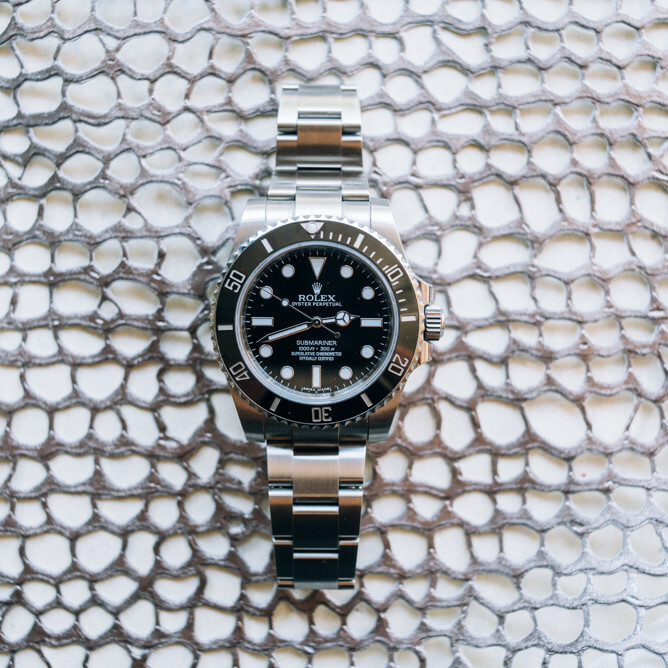 To earn this prestigious title, a watch must meet or exceed a list of criteria. What Does It Mean to be Swiss Made? Probably the most notable difference from this Omega Speedmaster and the ones that came before it is the moon phase. The stainless steel moon phase takes on a modern spin with a hyper-accurate moon display. According to Omega, the image of the moon “is as detailed as a NASA photograph”. However, Omega did indulge in a bit of fun, adding Buzz Aldrin’s footprint to the actual location where man first landed on the moon. Granted the foot print is grossly out of proportion. This moon phase is also highly accurate. It’ll need to be adjusted just once every 10 years, and this can be accomplished with a few turns of the crown. This Omega Speedmaster is powered by the new 9904 movement which is made up of 368 components, and you can watch this movement at work through the transparent sapphire case. It’s a Master Chronometer, meaning that it features anti-magnetic parts and a co-axial movement. Some benefits of the co-axial movement include not requiring lubrication and being shock-resistant. Additionally, this movement is METAS-certified which is an even more thorough and intense certification than the COSC. The certification requires a higher standard of durability and performance for the movement. In order to earn the METAS certification, the movement needs to work as efficiently inside of the casing as it does outside. This automatic movement can run on 60 hours of power reserve. Both watches are available in stores beginning October 2016. The steel model is priced at $11,300 USD and the Sedna gold model is $29,400 USD.